Heavy Gear Blitz 2017 Kickstarter Preview: Peace River Uhlan Strider Resin Add-On Model. Read more about Heavy Gear Blitz 2017 Kickstarter Preview: Peace River Uhlan Strider Resin Add-On Model. Heavy Gear Blitz 2017 Kickstarter Preview: Peace River Spartan Two Pack and Mameluk Add-On Models! Read more about Heavy Gear Blitz 2017 Kickstarter Preview: Peace River Spartan Two Pack and Mameluk Add-On Models! Heavy Gear Blitz 2017 Kickstarter Preview: Utopian Armiger and N-Kidu Drone Models! 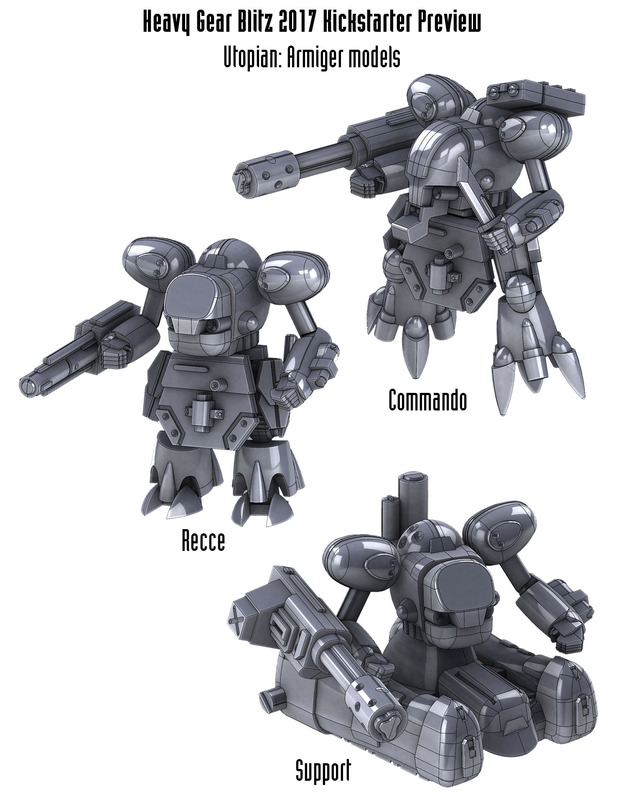 This preview features the Core Utopian forces 3d Models with the Commando, Recce, and Support Armigers plus the Commando, Recce, and Support N-Kidu Drones. Checkout the images below of the Armigers and N-Kidu Drones to see how the Solidworks 3d Models turned out. Read more about Heavy Gear Blitz 2017 Kickstarter Preview: Utopian Armiger and N-Kidu Drone Models! Time for a new spotted of Phil's Desk feature. This time Phil has been giving some love to Peace River in advance of our planned Kickstarter in September. The Chibi Chieftain will be Dream Pod 9's special Gen Con (August 17th to 20th, 2017) release and will be available to purchase at our booth and on the DP9 Online Store during our annual Gen Con Week Promotion. Checkout the photos below of the painted up Chibi Chieftain front and back views, plus with other the Chibi Gears and resin kit parts. This weeks preview is the Argos model for Peace River, which is their answer to the North's Kodiak and South's King Cobra models. The stock Argos model has a Heavy Rotary Cannon, Medium Artillery Rockets on it's back, and a Medium Vibro Blade (Axe). With this larger model we are trying a new 3 part poseable arm configuration, where the shoulder is hollow with slots for the upper arm to be positioned (angled) wider out and lower arm rotated in towards or away from the body and glued as wanted, checkout the image below with these and other detail improvements and information. New HPC-64 Hover APC Preview! A nice surprise for our CEF and PAK players while the staff is away this week on a short summer vacation. Our 3d Modeler, Tony, took the time to make a new HPC-64 Hover APC, which we are previewing today. The new resin and pewter HPC-64 model will be larger than the older pewter miniature and will be the same size as our HT-68 Hovertank. Checkout the attached image of the 3d model, which includes rear, underside, and exploded parts views plus the CMD upgrade, Medic, and Support variants. Read more about New HPC-64 Hover APC Preview! Happy Independence Day for our American cousins, we hope you all had a great July 4th. And a belated Happy Canada Day, July 1st, to all our fellow Canadians. The Heavy Gear Blitz 2017 Kickstarter to make plastic miniatures for the Peace River, NuCoal, and Utopia faction core models is now set for a mid-September launch. We had hoped to be ready for a July launch, but our 3d modelers are still working on the models for the NuCoal and Utopia. Plus with Gen Con in August and all the work that entails, we think its best to wait until after its out of the way.